Def Leppard guitarist Vivian Campbell and his side band Last In Line will play a pre cruise party show on 20th January. 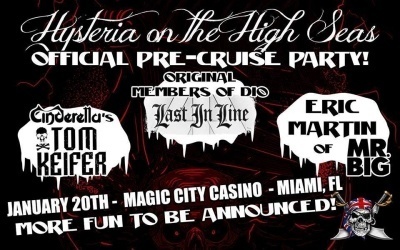 The show takes place at the Magic City Casino in Miami, FL a day before the Hysteria On The High Seas Cruise starts. Other acts on the bill include Tom Keifer of Cinderella and Mr. Big singer Eric Martin. No details have yet been announced of any shows on the cruise other than Last In Line playing once and two Def Leppard performances (theater and storytellers shows).